We’ve repeatedly documented that military waste and fraud are the core problems with the U.S. economy. For example, we’ve noted that we wouldn’t be in this crisis of hitting the debt ceiling in the first place if we hadn’t spent so much money on unnecessary wars … which are horrible for the economy. But it goes far beyond actual fighting. We could easily slash the military and security budget without reducing our national security. For example, homeland security agencies wasted money on seminars like “Did Jesus Die for Klingons Too?” and training for a “zombie apocalypse” instead of actually focusing on anti-terror efforts. 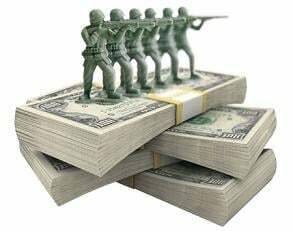 Republican Senator Tom Coburn notes that the Department of Defense can reduce $67.9 billion over 10 years by eliminating the non-defense programs that have found their way into the budget for the Department of Defense. BusinessWeek and Bloomberg point out that we could slash military spending without harming our national security. Indeed, we could slash boondoggles that even the generals don’t want. BusinessWeek provides a list of cost-cutting measures which will not undermine national security. American Conservative does the same. Moreover, we’ve shown that the military wastes and “loses” (cough) trillions of dollars. See this, this,this, this, this, this, this, this, this, this, this and this. The former Secretary of Defense acknowledged in May 2012 that the DOD “is the only major federal agency that cannot pass an audit today.” The Pentagon will not be ready for an audit for another five years, according to Panetta. The Pentagon is the only federal agency that has not complied with a law that requires annual audits of all government departments. That means that the $8.5 trillion in taxpayer money doled out by Congress to the Pentagon since 1996, the first year it was supposed to be audited, has never been accounted for. That sum exceeds the value of China’s economic output last year.